In a large bowl combine flour, salt, saffron and cumin (geera). Put aside. In another bowl, pour warm water, add sugar and yeast. Let sit for about 5 minutes until the yeast and sugar are dissolved. Add the yeast mixture to the flour mixture with enough water to make slightly firm dough. Mix well. Cover and let rise for about 1 1/2 hours. Punch the dough down and let it sit for another 10 to 15 min. To shape Bara, take about 1 tablespoon of dough, pat with both hands to flatten to a 5-inch circle. If dough sticks to hand moisten palms with some water. Fry in hot oil, turning once until cooked. Soak dried channa in 8 cups of water overnight. Then gently boil with a little masala the next day for 2 to 3 hours until soft. Mix masala with 1/2 cup of water. Heat oil in a large skillet. Add garlic, onion, and masala-water mixture. Cook for 2 to 3 minutes. Drain the channa, add to the skillet along with cumin and pepper. Cover and stir every now and again until the channa is very soft. Add water if the channa appears to be drying up. It should not be watery, just thick in texture. Add salt and pepper to taste. 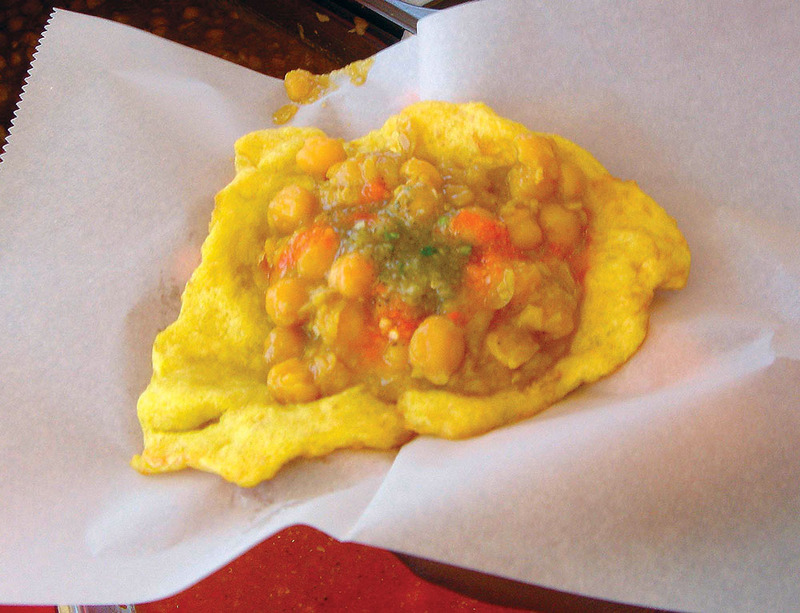 Open the bara bread flat in the palm of your hand and spread a small tablespoon of the channa mixture right across the top. Add hot sauce or kuchela, or both, to taste and put another piece of bara on top to make a sandwich. Serve immediately. Spoon a couple tablespoons cooked channa on a Bara. Add mango or tamarind chutney or pepper, if you wish, then cover with a second Bara - for a sandwich effect.